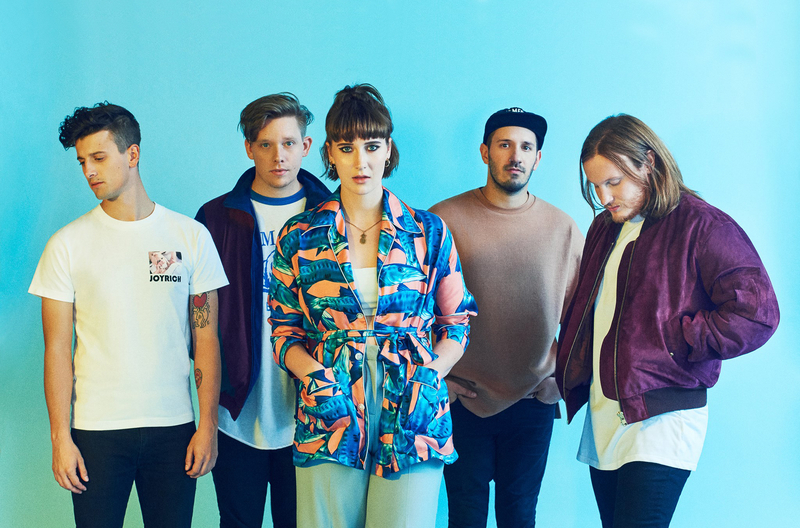 Brighton based five-piece, Fickle Friends, are about to embark on their first headline tour of the UK next month and a lot of people seem to be pretty hyped for it! If you’d asked me 18 months ago who Fickle Friends were, I doubt I’d have been able to tell you any of their songs. Now, however, they’re one of the biggest new artists around and one of my favourite bands. It hasn’t just been me that’s noticed how good they are either: there’s been a lot of attention from highly regarded sources in the music industry. Recent releases ‘Glue’, ‘Hello Hello’ and ‘Brooklyn’ were both played a lot on primetime BBC Radio 1, with the former being Scott Mills’ Track of the Week – a definitive sign of a quality pop song! Even an unreleased track from the Glue EP (‘Vanilla’) managed to make it onto Spotify’s New Music Friday playlist, alongside the likes of Justin Bieber and Bloodpop, Bastille and Miley Cyrus. Their sound is somewhere between 1980’s funk/disco and futuristic synth-pop, but the main thing that hits you about a Fickle Friends song is the happiness in (lead singer) Natti’s vocals. There’s something in her voice that makes you happy, and when that’s combined with the upbeat guitar and drums behind her then it’s very hard to not dance along while doing whatever you’re doing. Fickle Friends are the sort of band who can brighten up a dull task. 2017 has been a massive year for Fickle Friends as a touring act, right at the start of the year they performed as part of an innovative ‘festival-on-tour’ collaboration between NME and Topman. Not only does their inclusion on the line-up show the high regard in which they are held – alongside other brilliant breaking artists such as Will Joseph Cook and Clean Cut Kid – but to be involved on such a ground-breaking process surely nails their place as being at the forefront of a changing face of live music. This won’t actually be Fickle Friends’ first tour of 2017 either, they recently supported one of the biggest bands in recent UK music history, The Kooks (again alongside Clean Cut Kid), for their massive comeback tour; culminating in one of their biggest shows to date in London’s Alexandra Palace. You’d think after starting the year as busy as that they might have had a quiet summer to rest but they played countless festivals across the UK and Europe, including Boardmasters, TRNSMT, Kendal Calling and Slottsfjell in Norway. The most memorable of these came at Reading & Leeds where they performed a surprise set on the BBC Introducing stage, as well as their brilliant set on the perpetually full NME/Radio 1 stage. They showed no sign of being ‘fickle’ earlier in the summer after managing to perform in terrible weather at Y Not Festival before it was called off, but they told fans on Twitter that they would have carried on playing regardless! If the performances at these festivals are anything to go by, the level of energy from the stage emanates into the crowd and fills the room with an up-tempo buzz that gets everyone hyped. That’s great news because there are still tickets left for the tour, but they are selling faster and faster with every performance they do, so be quick and get yours now! SCAN will be at the Fickle Friends gig in Manchester on Tuesday 24th October, so keep your eyes peeled for the interview over the next few issues and go and buy your tickets to come with us!